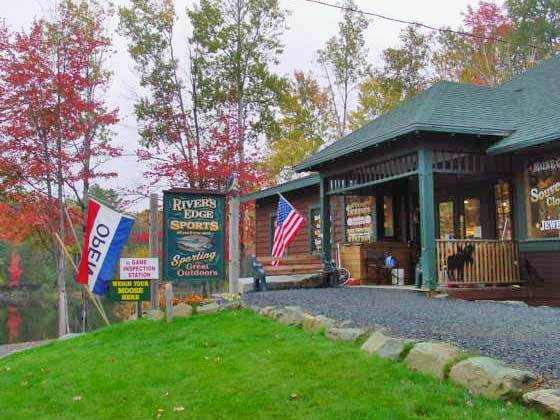 Rivers Edge Sports, adjacent to Rangeley Lake in the village of Oquossoc, boasts over 3,600 feet of sporting goods, outdoor clothing and Maine themed gifts. No, you won’t find a Wal-Mart in the tranquil New England flavored Rangeley Lakes Region, nor will you have to deal with the frustration of bumper to bumper traffic. There isn’t even a traffic light to trigger a bit of red-light madness. But what this region does have is a collection of shops and boutiques brimming with locally made arts, crafts and foodstuffs. This is a very creative, art minded community, eager to share their beautiful works with the world. If you already live in town, chances are you’ve already found some favorite haunts and met more than a few friends. Visitors, well you have the joy of discovery as you go about doing a bit of shopping in the Rangeley Lakes Region. Traditional grocery stores in the area include the Rangeley IGA in the Town of Rangeley, and the Oquossoc Grocery in the neighboring village of Oquossoc. These stores, along with The Farmer’s Wife, a specialty food store in Oquossoc, also offer an assortment of beer, wine and liquor. The Main Street Market in Rangeley also offers a number of health food items. Scotty’s Lobstah Pound in Oquossoc sells fresh Maine lobster and other seafood ready for you to take home. For a real taste of fresh, local produce visit one of the farmer’s markets, First Farm Produce in Rangeley and The Farmer’s Wife in Oquossoc. You simply must not leave the Rangeley Lakes Region without a bit of locally made, sinfully sweet Maine maple syrup. Go ahead, make your friends jealous. Maine Mountain Maple in Rangeley and The Farmer’s Wife in Oquossoc are good places to find this treasure. You can also find Maine Maple Syrup available on the internet. The Farmer’s Wife is a great place to find flowers or locally made Christmas wreaths. These wreaths are similar to the ones you will see at Proflowers. Bookstores are another draw, with creative names. The Books, Lines & Thinkers shop offers books as well as art pieces through its onsite Birds of a Feather Art Gallery. Award winning local artist Pam Ellis has watercolor works available through the latter shop. The Ecopelagicon Nature Store offers books, CDs, DVDs and other gifts, most with a nature theme. They even sell kayaks. Both stores are in the Town of Rangeley. Other local art shops include the Gallery at Stone Batter Station in Oquossoc, which also sells antiques, and the Sugarwood Gallery that features artists such as Don Waterhouse, an award winning local photographer. The Threads Galore Quilt Shop offers handmade quilts, accessories and wall hangings as well as the fabric and patterns to create your own. The shop even offers classes to get you started. The Camp Do What You Wanna General Store, on Maine St., is an interesting spot to spend time browsing. In the true spirit of old time general stores, it is one stop shopping. Buy a tasty snack, a bit of artwork from the onsite gallery or rent a sled or ATV to have a bit of fun. They also offer breakfast and lunch served on the porch overlooking Haley Pond. Antique shops are popular in the Rangeley Lakes Region, which comes in handy when you want to furnish your new home in traditional style. Local shops in the Town of Rangeley include Dallas Hill Antiques and Gearsyl Antiques. Other outfits offering home furnishings include Welcome Home Furniture & Accessories, Rangeley Homestyle, and Gallant’s Discount Furniture in nearby Roxbury. J. Keith DellaVale and his Custom Twig & Log Furniture enterprise are available for those wanting the rustic, log cabin look with an artistic flair. Rangeley Lakes Builder’s Supply is the local hardware store, also offering appliances and barbeque grills. The Rangeley Fireplace & Stove Company is handy if you’re looking for that wood burning stove and a bit of local ambiance. Blue Flame Gas also sells and installs woodstoves, grills and appliances. The firm also delivers propane to homes and businesses throughout the area for heating, cooking and hot water systems. Sunrise View Farm and Rangeley Feeds and Seeds specialize in greenhouse and gardening supplies. Rangeley Auto Supply, Power Equipment and Docks are there for your power tool and equipment needs. Even shopping for the basics in Rangeley is an adventure. Find gifts, clothing and footwear at The Alpine Shop, Jannace’s Backwoods Clothing or the Rangeley Region Sport Shop. Judy Wicken, a Mary Kay Cosmetics Consultant, is also located in Rangeley. Lakeside Convenience store is there when you need sundry items in a pinch. Your four-legged or feathered friends are not left out. Mountain Greenery, Rangeley Feeds & Seeds and Sunrise View Farm all offer an assortment of bird seed, pet foods, toys and/or related supplies. Mountain Greenery also offers pet day care and grooming services, as well as scheduled veterinary clinics onsite. In such a sports friendly area it’s no surprise that a number of recreational outfitters and dealers have set up shop. The Ecopelagicon Nature Store, Rangeley Region Sport Shop and Oquossoc Marine all offer boats, canoes and kayaks. The latter store offers snowmobiles and ATVs, as does Boss Power Equipment, the Powder Dreams Ski Store and Rev-It-Up Sport Shop. River’s Edge Sports Shop, the largest of its kind in Franklin County offers clothing, gifts and sporting equipment for all seasons. No matter if your pleasure is fishing, hunting, camping, hiking, skiing, snowshoeing or any manner of outdoor sports, there’s some place in town to find all you need to pursue that passion. Common themes found throughout the gift shops and galleries, not to mention local clothing stores, is anything to do with moose, loons and the lupine flower. Souvenirs and clothing that revolve around fishing is also a big draw. Maple sugar candy and themed chocolates are also a hit. Maybe you’re not so inclined to take home a real moose, but a stuffed animal one is pretty darn cute.